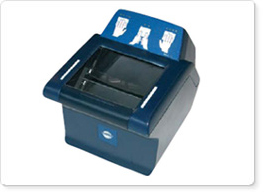 DactyScan84 is a compact and FBI certified 4-slap scanner in full compliance with the "10-print capture scanner & software user group requirements" suitable for all applications in need of 10 fingerprints flat and rolled acquisition. Main applications are visa issuing, e-ID documents and criminal identification. Plain four fingers up to 3.2" x 3.0"
Two plain thumbs up to 3.2" x 3.0"
Flat finger up to 3.2" x 3.0" - Rolled finger up to 1.6" x 1.6"